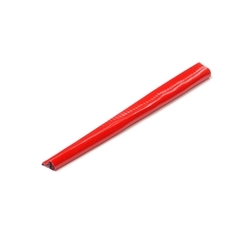 1/8in Red Poly Fiber-Fill Insert 3-7/8" length 31inc 12-218 / BOWES TR 15025SS Box of 50. These inserts are gray vulcanizing gum coated, wrapped in blue protective poly, and have a reinforcing core of fibre, designed to allow their easy insertion through steel belted passenger or truck radial tires. Unlike competitive products that are fabric throughout (forcing the injury to take the shape of the insert), Fibre-Seal have a larger amount of rubber coating, allowing the insert to conform to the injury. Fibre-Seal inserts will vulcanize chemically or in a heat curing system.